Jason Shafrin, our favorite Healthcare Economist, is hosting Health Wonk Review: Super Bowl Edition, the best of the recent postings from blogging health policy wonks. Jason cuts right to the chase in a compact, digest version of posts that will keep you up to date on issues related to healthcare costs, policies, IT developments and safety. Oh, and kindness – which should be a de facto component of healthcare, no? Is the focus on concussions having an impact on football? Justin Rodriguez of the Times Herald-Record reports on how the concussion crisis is a big blow to football. Since 2009, fatalities related to large truck road accidents have increased by 17%. In 2013, that number rose to 3,964 fatalities, the fourth straight year of increases. This bucks the trend of vehicle-related fatalities overall, which have been steadily decreasing. 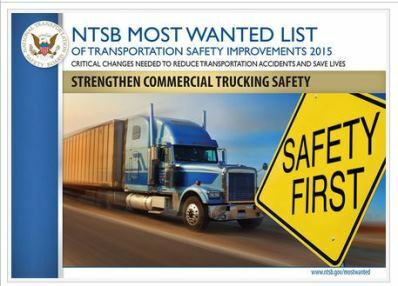 Fatalities involving large trucks and buses represent about 4% of the overall annual vehicle-related fatality total. The increase in fatalities has prompted the National Transportation Safety Board (NTSB) to call for tighter commercial trucking regulations. One excellent resource for trucker safety is TIRES (Trucking Injury Reduction Emphasis), a research project developed by the SHARP program at the Washington Department of Labor & Industries. SHARP’s research shows that trucking has some of the highest claims rates and costs in the State of Washington. In addition to a wide range of training and safety information, TIRES an excellent Keep Trucking Safe Blog that we’ll be adding to the sidebar. Hot off the press – Vince Kuraitis posts the first Health Wonk Review of the new year, “Shake the Winter Blahs” Edition at the e-Care Management Blog. There’s the usual grab-bag of topics from some smart heath policy bloggers: Did you know that there’s a brouhaha over Hepatitis C Drugs? You can find out more about it in this edition. You can also get the latest in digital health trends, an update on how ACA and Medicaid expansion are playing out, and much more. The night shift is commonly referred to as the graveyard shift and a new study about associated health risks shows that it might be aptly named. Previously, the World Health Organization has linked working the night shift to cancer, based on studies with nurses. Now, a new study published in the American Journal of Preventive Medicine this month, shows that nurses who worked night shifts over an extended number of years experienced an increase in mortality rates for all cause (11 percent higher) and cardiovascular disease (19 percent higher.) In addition, women who worked rotating night shifts for 15+ years had a 25 percent higher risk of lung cancer. Kim Krisberg summarizes the study findings in her post at The Pump Handle. Do Not Fail to Care, Roberto Ceniceros, Risk & Insurance: “With the predicted spread in pricing — as some insurers reduce policy prices to gain market share while others tighten up their offerings — it stands to reason that those employers that manage their claims experience well will receive the better policy renewal deals and a broader range of coverage choices when arranging insurance. MSHA Says Coal Mining Deaths at Historic Low – “Preliminary data released by MSHA show 40 miners died in work-related accidents at the nation’s mines during 2014, two fewer than the previous year, according to the agency’s news release. Coal mining deaths dropped from 20 in 2013 to 16 in 2014, the lowest annual number of coal mining deaths ever recorded in the United States.” Related – Ken Ward, Coal Tattoo: Is a record low for mining deaths enough? 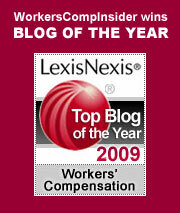 Did agents go too far in trying to catch a claimant in workers’ comp fraud? – “A federal judge in Portland chided government agents Friday for running a series of elaborate ruses to catch a U.S. mail carrier they accuse of fraudulently obtaining workers’ compensation benefits.” Perhaps setting up a phony business, luring a claimant into a deep sea fishing expedition, posing as a vocational rehab specialist and setting up 1,000 hours of surveillance is a bit over the top?